If you have read a couple of my previous articles, you would know that I harbour quite a few spot for Japan, its culture and its culinary emissions - Sake being only one of them. While I was used to enjoying Sake in Japanese restaurants around the globe, my appreciation increased exponentially for this versatile spirits once I was introduced to the tradition and educated on the creation of it in country by ‘toji’, i.e. a Japanese luminary versed in brewing it in the traditional way. Needless to say that I was delighted to come across a local sake variant named after the profession that produces the drop, i.e. Toji Sake out of Melbourne, Australia. Yuta Kobayashi and his wife have created an approachable sake that strikes the balance between pleasing the Western palate without diluting natural flavours and the DNA that sake in its home country is appreciated for. Toji Sake is fresh, dry, astutely-balanced, artisanal sake that can be sipped either lightly refrigerated by itself (we are talking slightly below ten degrees Celsius, not iced, you heathen) or as a base component served as a cocktail with a twist. Purity is the credo that is the foundation on which the pure Toji Sake builds with the rice being sourced from Niigata Prefecture and the H2O straight from the Asahi Mountain range – sans any preservatives. The bottle the sake lives in is a simple, yet expressive and beautiful work of art in itself that will adorn any liquor cabinet. Japanese mythology is full of wondrous allegories, stories and meaningful figures and deities. One of the myths is cantered around Inari Okami being the god of Rice, Saké, Swordsmiths and Foxes – foxes because they were the guards of the Torii gates are were only meant to let the purest of spirits pass. That is how the name for Four Fox Sake was derived, and the etymology is paid homage to via its crest which depicts foxes with rice fields at their feet. Given the emphasis on purity, it is not further wondrous that the water is again sourced from snow and we find ourselves back in the Niigata area if we are looking for the place where Four Fox Sake sources it from. Not unlike Toji sake, Four Fox Sake is a “Junmai Daiginjo”, i.e. the highest grade and purest classification of sake, and the bottle with its wooden cap and chrome finish proves to be an apt vessel for the drink. 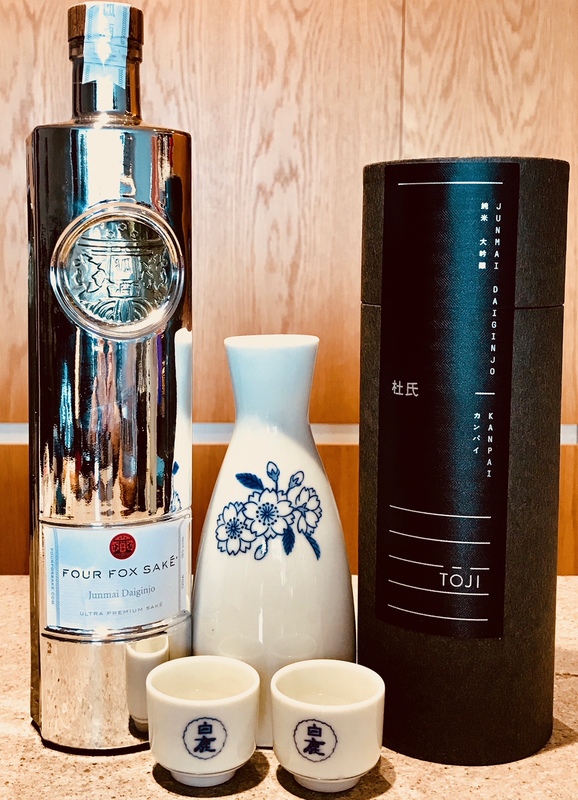 While I usually prefer a peaty whiskey, both Toji Sake and Four Fox Sake have become staples in my bar that are enjoyed neat and independently from Japanese fair and has long established itself as a tipple and cocktail ingredient not unlike gin or vodka.